As Lifeguard Captain Dan Atkins stood at the podium and raised his arm, the beams from the temporarily erected spotlights glinted off a metallic flask he clutched in his right hand. The flask, Atkins told the audience assemble at Redondo Beach’s Seaside Lagoon Wednesday night for the 38th Medal of Valor Awards, was one of several he had custom ordered, all engraved with the date of Sept. 15, 1995: the day the county lifeguards became a part of the Los Angeles County Fire Department. 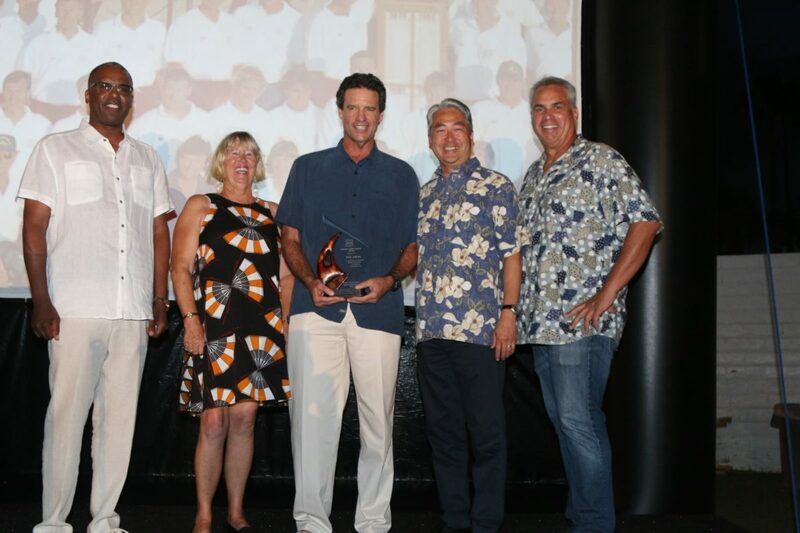 Atkins, a 37-year veteran lifeguard, accepted the evening’s Lifetime Achievement Award, while seven other guards were honored for their life-saving heroics over the past year in the annual ceremony that kicks off the International Surf Festival. Atkins served as president of the L.A. County Lifeguard Association during a crucial time in the 1990s. The lifeguards had bounced around from county agency to agency over the decades but had found a relatively stable home in the Department of Beaches and Harbors. Then budget cutbacks were pressuring the department’s bottom line, and longtime lifeguards were facing pay cuts of as much as 25 percent. Atkins and the lifeguard association paved the way for the guards’ transition into the fire department. Later, with the help of then-Supervisor Don Knabe, helped secure funding for the county to purchase beaches, including Manhattan and Redondo, that was owned by the state but staffed by county guards. The moves helped shore up lifeguard salaries and brought stability to the department, Atkins said, solidifying its position as the world’s premier ocean-rescue association. “I hope you young lifeguards realize how lucky you are. A lot of blood, sweat, and tears went into this,” Atkins told the crowd, a comment that earned louder, more sustained applause than all of the mayors, state legislators and fire department brass who gathered for the event. Also honored was Captain Brandon Chapman, who received the distinguished service award for saving the life of a 14-year-old boy who could not breathe when he became trapped under several feet of sand near the Venice Pier this past winter. Chapman arrived on the sand and organized several bystanders into a crew of diggers. As the boy became visible, Chapman crucially decided to keep digging at a steady pace, rather than try to pull him out by an arm and risk more sand flooding in. Thanks to Chapman, the boy survived and made a complete recovery. The efforts of Ocean Lifeguard Specialist Greg Crum and Ocean Lifeguard Ignacio Pagliaro also earned the Distinguished Service Award. Crum was working the 40th Street Tower on May 12 when a man who had just finished a workout collapsed in the El Porto parking lot. The apparently healthy man, a 19-time marathon runner, had lost consciousness. Crum ran from his tower to the lot, where he found volleyball player Matthew Donatucci performing CPR, relying on lessons he had taken at El Camino College just a few days prior. Crum radioed for help and set up an automated external defibrillator to shock the man’s heart into rhythm. Meanwhile, Pagliaro was leaving the headquarters station near 26th Street when he heard the call and raced to the parking lot in his truck. He arrived shortly after Crum administered the shock from the AED, and took over CPR from the Good Samaritan. Firefighters then took the victim to the hospital. He made a full recovery and attended Wednesday’s ceremony with his wife. Zuma Beach is known for its powerful summer surf, and the volume of water moving around one day last June provided the conditions for Rescue Boat Captain Chris Lallone and Captain Patrick O’Neill to earn the Distinguished Service Award, and for Ocean Lifeguard Specialist Tucker Hopkins to get the Medal of Valor. A strong rip current sucked two men out to sea. Hopkins was on duty and dove into the waves. He swam out to the first man and made sure he was okay, but notice that the other man was being sucked further out and appeared in greater peril, moved on. He reached the further man, who was conscious but not responding to orders to grab the rescue can, so Hopkins sidestroke with the man out to Baywatch Malibu, which was manned by Lallone and O’Neill. Just as they got there, the man went limp and sunk. Hopkins dove down and pushed him to the surface. But getting the man into the boat proved a struggle all its own. “This is a very large man with a lot of suntan lotion: very slippery,” Lallone said. After getting the man onto the boat deck, the guards saw that he needed medical attention. But they were far out beyond the surf line at this point and had to figure out how to get him in. They decided to motor down toward the Zuma headquarters station, where another lifeguard launched a jetski. From the boat, the guards put the man on the ski’s sled, but because he was going in and out of consciousness, Hopkins laid on top of him to prevent him from sliding back into the ocean. The man eventually made a full recovery. At the beginning of the ceremony, Los Angeles County Supervisor Janice Hahn, who represents the South Bay, said that efforts like the one at Zuma revealed the importance of having top-quality guards, especially as the region basks in a hot, sunny summer. “Residents from around Southern California are coming to Los Angeles County to enjoy our beaches. But as you all know well, in a matter of seconds, a day can go from great to the worst. That is why we have the best of the best,” Hahn said. Joe Rickabaugh’s Medal of Valor-earning rescue came while he was off duty. The lifeguard was catching dawn patrol at County Line during a south swell in May before heading into work. He heard a cry that sounded like it was coming from closer inside, so he caught a wave and surfed his way to a man floating in the water. Although the victim was conscious, he had lost all feeling in his extremities. Rickabaugh used a surfboard to stabilize the man’s spine, then paddled him into shore through the rough surf. State beach personnel saw what was happening, and arrived on the shore with a stretcher to replace the surfboard. A woman watching the surf had called the fire department while Rickabaugh was bringing the victim in. A medical helicopter would eventually land on Pacific Coast Highway to take the victim away. But County Line’s northern edge is marked by a rocky shore and a steep cliff face, so getting the victim out of the impact zone was only half the battle. Rickabaugh and state beach responders formed an assembly line push the immobilized man up the cliff side. As the guards waited with the victim for the helicopter to arrive, John Regan, a state park lifeguard assisting in the rescue, saw Rickabaugh grab the victim’s car key from his wetsuit, take the surfboard to his car, grabbed the man’s cell phone, then locked his car and brought the phone back. He was taken aback at how, in such a tense situation, Rickabaugh was able to think about other ways to comfort the victim. “Joe was so concerned not just about the man’s life, but his stuff too,” Regan said.